When it comes to health care, it can really pay to shop around. In New York City, a cholesterol test can cost as little as $14 or as much as $1,070 depending on where one goes, according to a new study of health care costs in America's 30 most populous metro areas by Castlight Health. The price of a mammogram in Dallas ranges from $50 to a whopping $1,045. And in Chicago, the charge for seeing a primary care doctor for a routine exam can be only $50 or up to $423. Castlight Health analyzed the variations in cost of eight common health care procedures. The company, which contracts with employers to give workers price and quality data for healthcare providers in their network, drew on the millions of claims in its system. 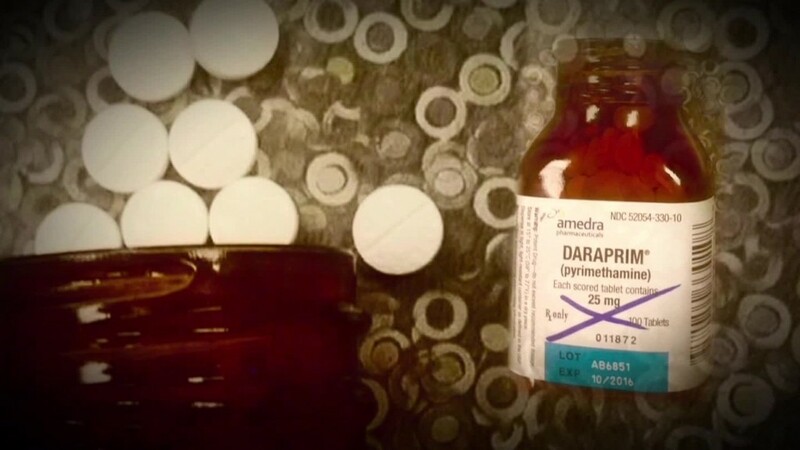 The report found massive disparities in the cost of these doctors' visits, procedures and tests, both within metro areas and nationwide. Prices include both the employee's and employer's share of the bill. Costs vary so widely because there are no uniform standards in the health care system, said Jonathan Rende, Castlight's chief research and development officer. Insurers and providers negotiate independently for each of the insurer's networks. Employers, workers and often providers don't know what the prices are, he said. "There is no transparency," Rende said. Here are some eye-popping differences around the country. A mammogram costs an average of $271 nationally. But this can mask the significant price differences. 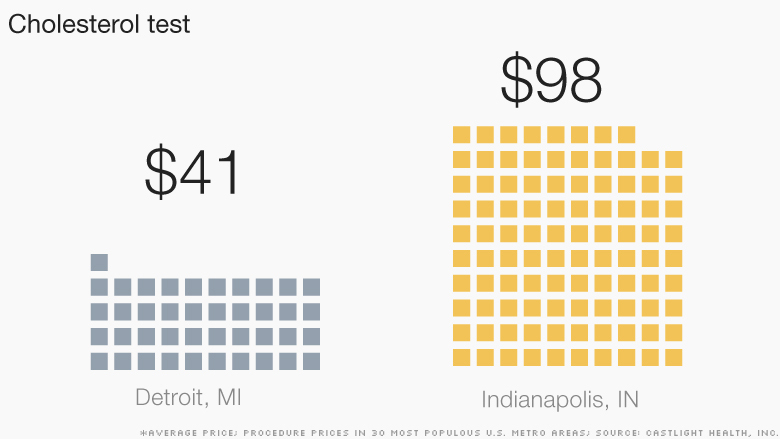 For instance, the average price in Sacramento, Calif., is a hefty $485. But the important annual test for women over 40 can be had for as little as $179 or as much as $556 in that city. 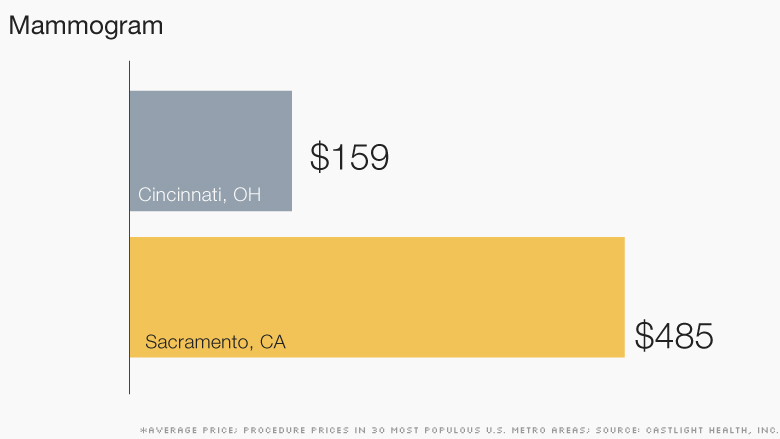 And while Cincinnati, Ohio, has the least expensive mammogram at $159, on average, it could still cost as much as $291, depending on where one is tested there. An annual checkup in the U.S. costs $148 on average. 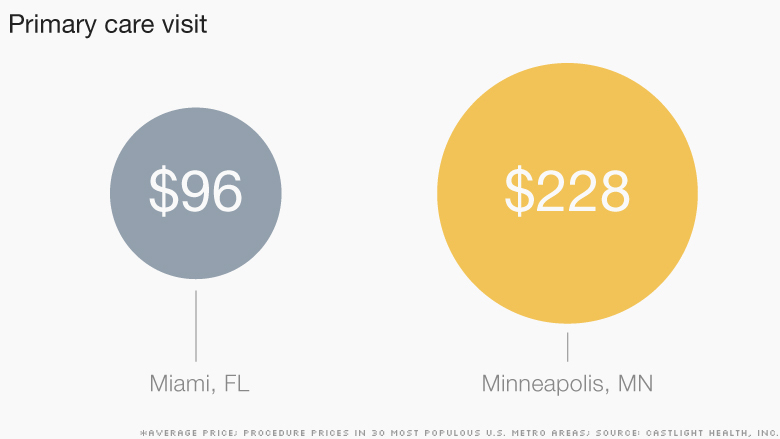 In Minneapolis, however, the average tab is $80 higher, while in Miami, it's $52 lower. The highest price Castlight found was $464 in in San Francisco. Chicago residents, meanwhile, can get a physical for as low as $50. The average sticker price for a cholesterol test is $62 nationally. And in Detroit you can get one even cheaper. However, it can approach triple digits in cities such as Indianapolis and San Francisco. Few places have as wide a gap as New York City, where the top price is 79 times the cheapest charge. But consumers would still benefit from shopping around, especially in metro areas such as Dallas and Tampa, which also have large variations. Cholesterol tests have also gotten pricier in 29 of the metro areas studied. In San Francisco, the average cost rose by 282% since last year. Only Kansas City, Missouri, saw a decline, of 26%. Consumers aren't used to comparing costs when going to the doctor or getting a lab test, in large part because it's been tough to get prices in advance. But they are shouldering more of the tab as employers raise deductibles and co-pays or switch to co-insurance, where the patients pay a percentage of the bill.